After creating your first series of pintucks, all running in the same direction, you'll press your fabric so that your pintucks all lie flat. 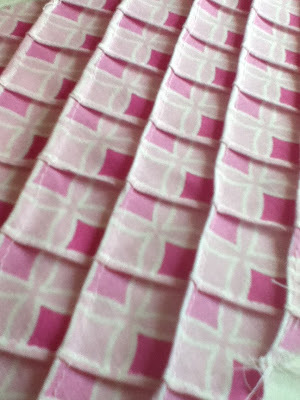 Rotate your fabric, and sew additional pintucks running at a 90 degree angle to the existing pintucks. I generally use a seam allowance between 1/16th and 1/10th of an inch for my pintucks. You can use diamond pintucked fabric just like you would any other fabric. The tucked detail creates can add a bit more visual excitement to a simple fabric or project. If you don't want to spend the time sewing diamond tucks on your fabric, you can find some diamond pintucked fabrics in the store. I've had diamond tucked fabric on my mind for a while now, but was excited to see some diamond tucked table linens at a wedding reception this weekend. You can also read Jill's Diamond Pintuck tutorial for more information. It's funny - I think I've seen taffeta versions of this in the past, but I love your sample with the print fabric. I'm going to have to play with this idea now :) Thanks for sharing.